EDITOR’S NOTE: Aldi now offers a gallon-sized bottle of Tuscan Garden Distilled White Vinegar in addition to the 32-ounce bottle discussed here. Visit this link published in May 2018 to read more. Classic white vinegar has a multitude of uses, from salad dressing to household cleaners to natural treatments for clogged drains. That’s why it’s a staple Regular Buy item on Aldi’s shelves, nestled among the ketchup, pickles, and salad dressings. 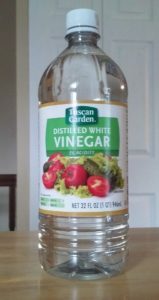 Aldi’s Tuscan Garden distilled white vinegar has 5% acidity (diluted with water), is sold in a 32-ounce clear plastic bottle, and is naturally gluten free (according to the packaging). It’s your standard, practical white vinegar and is indistinguishable from other name brands. Not much to say here. My only wish is that Aldi sold this in a larger bottle. Aldi’s 32-ounce bottle will do fine if all you do is make salads. The bottle’s compact size will fit nicely on your pantry shelf. However, with the rise in demand for natural cleaning products, I find myself using more white vinegar than ever. I dilute it and use it as a shower cleaner or to clean my kitchen counters and sinks. I pour it down my drains, after pouring in a cup of baking soda, to help get rid of clogs. The problem is that using it as a cleaner leaves little for cooking and eating. The drain-cleaner method alone will use up at least half of Aldi’s 32-ounce bottle, or more depending on how bad your drain is or if you’re cleaning multiple drains. I like to have a lot of vinegar in the house because I use it for so many things, and when you need to clean a drain, it’s often a desperate situation. Okay, so I figured I’d just buy multiple bottles of Aldi’s white vinegar so I would always have some on hand, and I’d save money because I’d be buying them at Aldi, right? I generally preach the virtues of Aldi’s everyday low prices because I believe, when you are comparing apples to apples, Aldi’s prices are usually lower than big box store prices. This time, though, I decided to compare apples to oranges. I wondered if Aldi’s price for a small bottle of white vinegar could compete with a big box store’s price on a bottle of vinegar that is considered more of a bulk size. I purchased a 1-gallon (128 ounces or 4 quarts) bottle of Great Value distilled white vinegar from my Walmart for $2.48. I purchased a 32-ounce (1 quart) bottle of Tuscan Garden distilled white vinegar from my Aldi for 79 cents. The Walmart bottle contains four times as much vinegar as the Aldi bottle. In the photo below, the Aldi product is on the left and the Walmart product is on the right. Doing some simple math, the Walmart vinegar comes out to 62 cents per quart, while the Aldi vinegar is 79 cents per quart, for a difference of 17 cents per quart. Long story short: At my local stores, the Walmart generic bulk-size white vinegar is cheaper than Aldi’s small bottle of white vinegar. We’re talking about pennies here, so it won’t break your budget to buy this item from Aldi, but it is cheaper in my area to buy bulk vinegar from a big box store. Just be aware that the bulk bottle won’t fit as nicely on your pantry shelf as Aldi’s small bottle. We can always hope that one day Aldi will begin selling larger bottles of vinegar, and then we’ll compare prices again. Aldi’s Tuscan Garden Distilled White Vinegar is a good, classic vinegar for using in salad dressings or for making household cleaners. 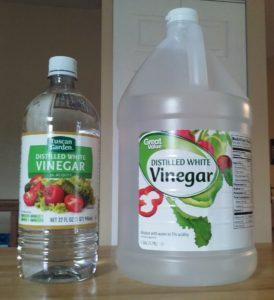 The price is fine, but if you use a lot of vinegar for cooking and household cleaning, it is less expensive to buy a bigger bottle of generic vinegar from a big box store.